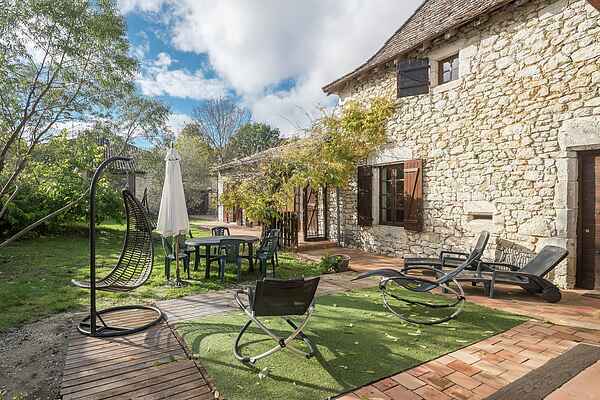 This detached and distinctive holiday home in Bouniagues is the quintessential base for an outstanding holiday. You will find a baker and an excellent restaurant at a mere eight hundred meter walk. The gorgeous garden, covered terrace, the shady trees lining the driveway and the delicious swimming pool (that you share with the owner) ensure a great stay here. It will be completely perfect once you explore the region. We'll mention Bergerac (13 km) to begin with. Take a ride on an old sightseeing boat or a canoe on the Dordogne river, saunter through the narrow streets or go on a shopping spree. Tired of walking? Enjoy a nice cool drink at one of the outdoor cafés surrounding the statue of Cyrano de Bergerac. It's not at all difficult to find an excellent glass of wine around here. The area is studded by vine-covered hills. From the limestone plateau at Château de Monbazillac (10 km), you have an beautiful view of the area. The region does not just offer culture. Water-sport aficionados can really go wild at the recreational lake of Lougratte (21 km). The children will also remember a visit to the magnificent water park at Le Bugue (46 km) for the rest of their lives. What an adventure!